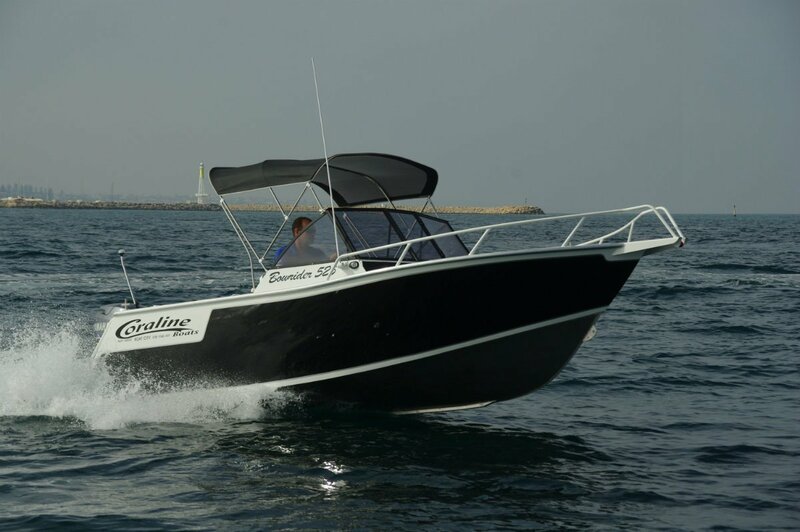 Many people associate the bow rider layout with sheltered waters. This is fair enough for many imported examples with low freeboard and not even a decent anchoring system, but the Coraline 525 is in a different class: plenty of freeboard on a sea going hull, bowsprit and anchor well, abundant rails and a self draining deck. The kicker is the pot winch and tipper – not too many crays in the river. The buyer wanted a boat the whole family could enjoy, something to pull his pots from, and a boat to tow north for holiday fishing. In a larger boat the choice might have been a walk around, but In this size range a bow rider was probably the best bet. The forward cockpit has settees around its perimeter, and could comfortably seat three. Two seats at the twin dashes plus the rear settee add another five options. These add up to room for a big family. For non-family days the forward upholstery can be left at home. The rear settee has the useful options of folding or simply lifting out for days with just two fishing. Two is the commonest number in a fishing boat but the Coraline could very comfortably fish three; with less luxurious elbow room four would not be a squeeze. Stability is a lot more than acceptable. Coraline’s new generation hull with more V and wider chines achieves the trick of combining this stability with a good ride. There is no catch tank. These are standard or optional on almost all Coralines, but the owner’s reasoning is easy to deduce. Except with low sea water temperatures an ice slurry is not going to survive long in a non insulated tank; straight sea water in the tank will do nothing to stop the fishes’ deterioration. In northern waters the tank would turn into a fish cooker. The easy solution is a portable ice box, which has the extra advantage of being shoreside transport for the catch. The bow rider layout automatically puts the driving position well aft, comfortably away from the slam zone. 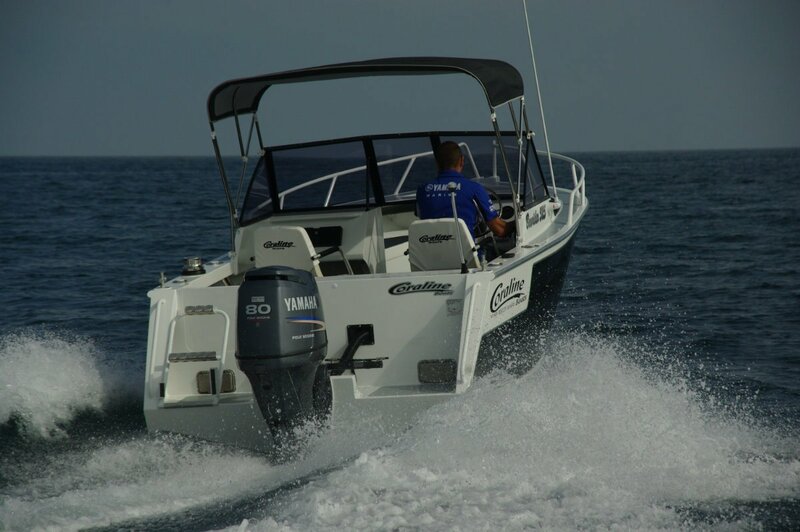 Not that this boat is prone to slamming, but we tend to open the throttle as far as comfort allows and the 525 allows quite a distance. People ahead of the windscreen might disagree, but there is always the rear lounge seating alternative. What forward passengers can be grateful for is a lack of spray. Subtleties of hull shape make some boats send water over passengers on the mildest days, but this one is well behaved. Only the first class seats get shade, provided by a simple Bimini that furls neatly into a sock. And it does the job. To the extent that you have to wonder at the clears so many opt for with more complex canopies; why would you be out there in weather that needed them? The 525 was fitted with an 80hp Yamaha four-stroke, and with a very worthwhile extra: hydraulic steering. It is worth gold with lots of wheel turning to do (rounding up on cray pots?) but at any time the lack of effort it needs improves the day’s experience. The Yamaha itself did a fine job. Crisp response and a top speed, two up, of 34 knots. The boat’s natural trim is good, and very small amounts of power trim were enough to adjust it for different headings. 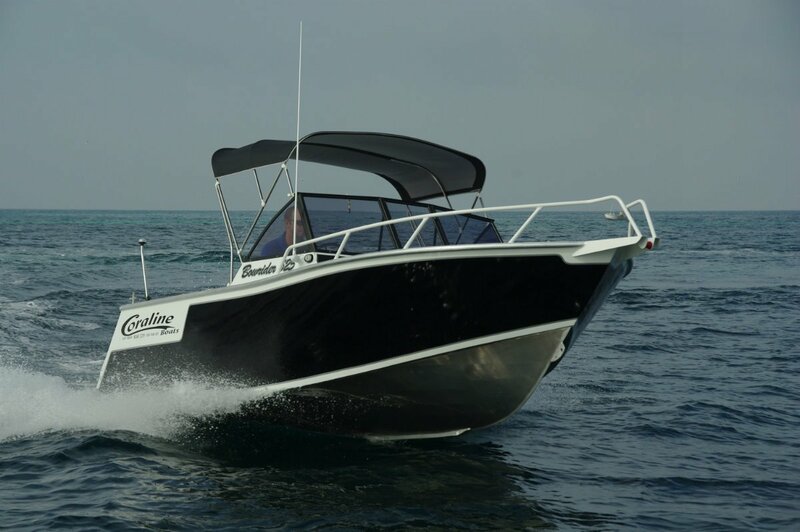 The Coraline’s fit out and equipment inventory leaves nothing to buy beyond bait and fuel: good ladder with transom door, radio and sounder-plotter, navigation lights and, not all that common in this style of boat, plenty of storage. Under the forward seats, in a pair of transom lockers, in cave lockers beneath the main seats and in side pockets is enough room to require a consultant to fill. The whole rig sits on a multi roller trailer that rounded our day nicely by needing little winching effort.